A butter, Dijon, rosemary, and thyme crust hugs this juicy roast. The genius “reverse-sear” method lets you roast the meat hours ahead of the final sear, so you can pull the rest of the meal together without worrying about when the meat will be done. Plus, you can do the final sear either in the oven or on the stovetop, depending on what’s going on with the rest of the menu. Finish each slice with a pat of the same savory butter that coats the roast. 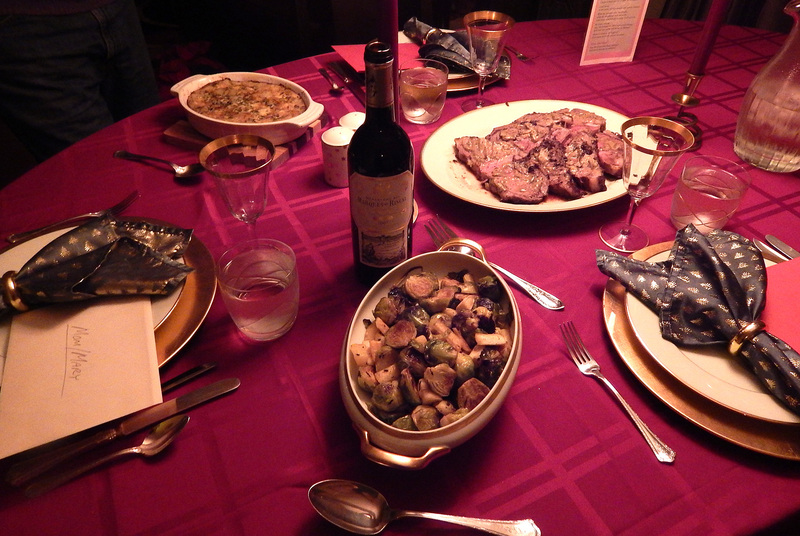 This is truly a special occasion meal, and why we planned it for Christmas Day. 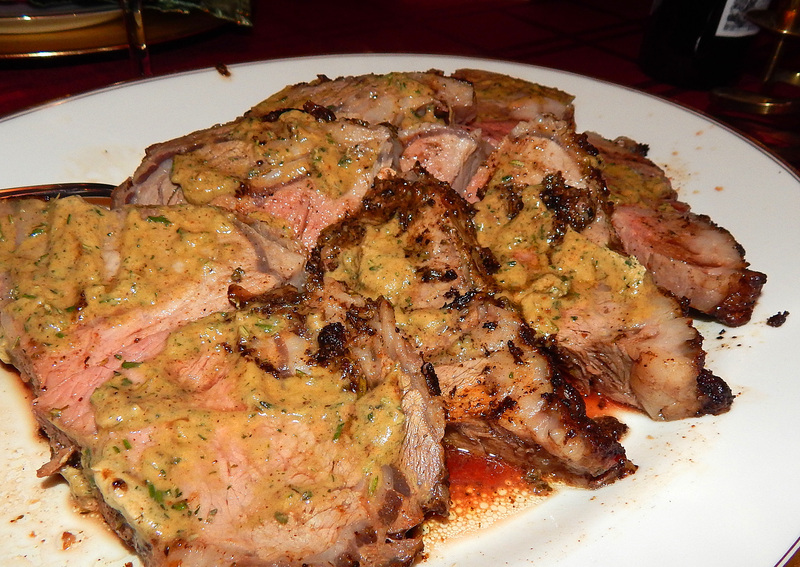 Russ included a powder of dried porcini mushrooms that he ground up in a food processor for an added touch in the rub. Making the herb butter rub in a food processor. 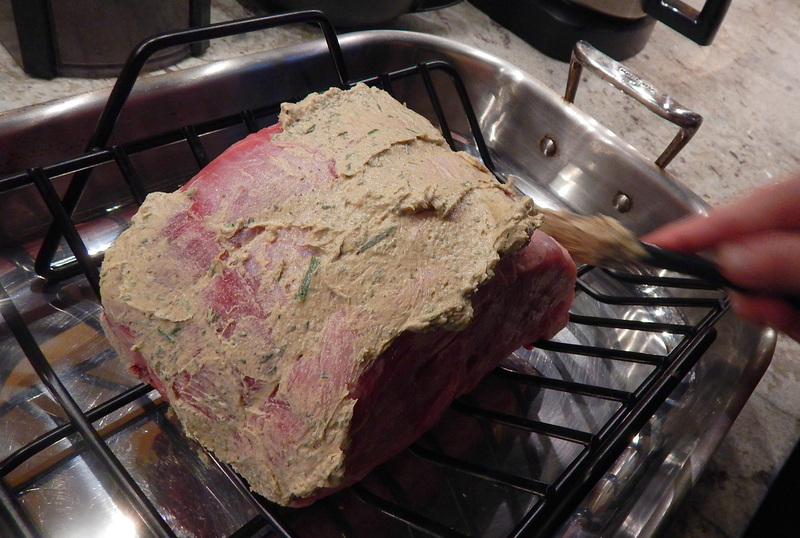 Smearing the herb butter over the raw roast. 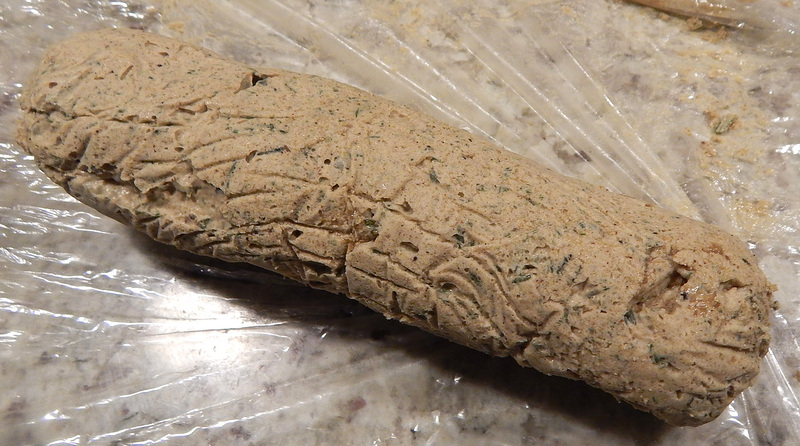 Herb butter roll for topping meat slices. 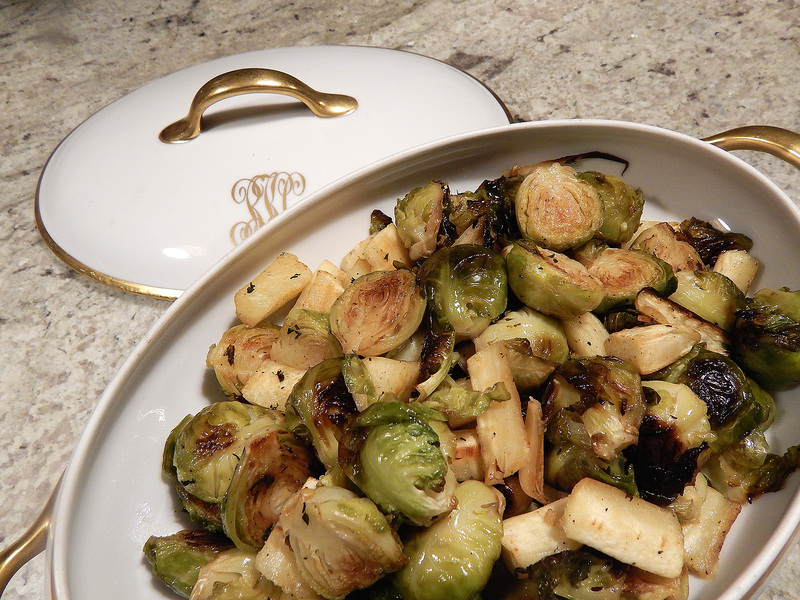 Roasted brussels sprouts, parsnips and garlic. For our sides we roasted brussels sprouts, parsnip pieces, and garlic cloves coated in shallot olive oil, and sprinkled with fresh thyme, salt and pepper. 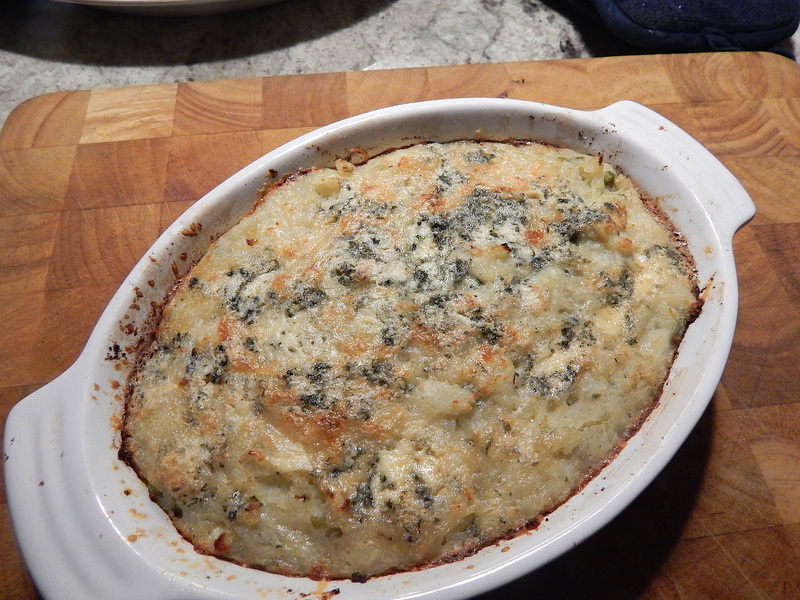 Originally meant to have twice-baked potatoes in the skins, I mistakenly peeled most of them before I realized what I had done (my brain was on vacation too), so I switched gears and made twice-baked in a casserole dish as opposed to in the potato shells. Twice-baked potatoes in casserole dish. Melt the butter in an 8-inch skillet over medium heat. Let it foam until it turns light brown and smells nutty, about 5 minutes. Immediately pour the butter into a small heatproof bowl, leaving most of the milk solids in the bottom of the skillet. Refrigerate the butter until solid, about 1 hour. Purée the garlic, rosemary, sage, thyme, mustard, Worcestershire, 1-1/2 tsp. salt, and 1 tsp. 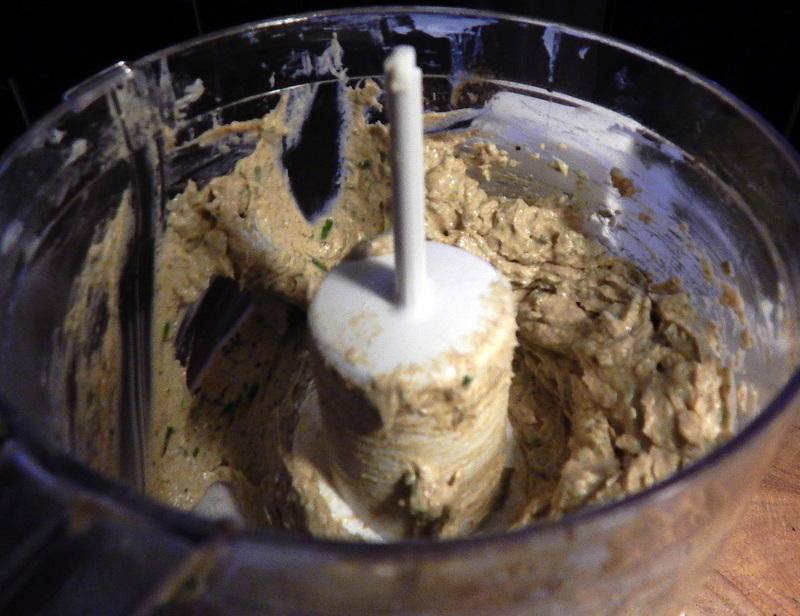 pepper with the solidified browned butter in a food processor to make a thick paste. Reserve 1/4 cup of the butter and rub the rest all over the roast. 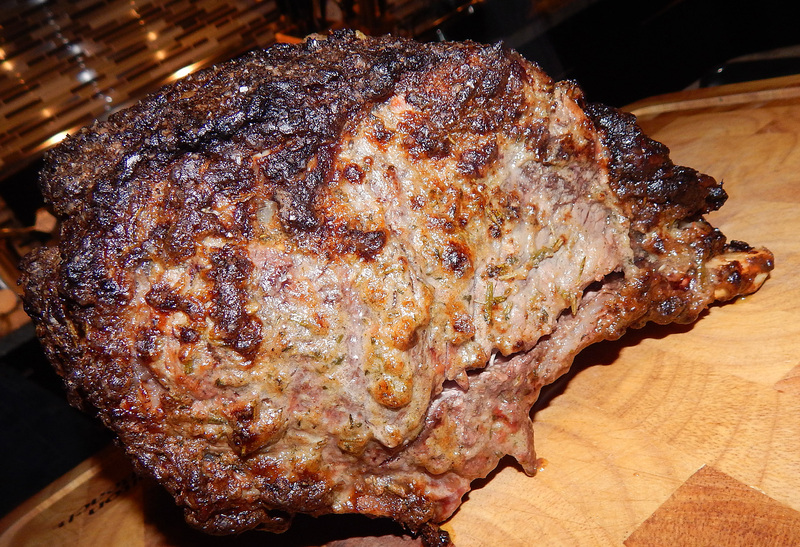 Put the roast fat side up on a rack set in a roasting pan and let sit at room temperature for 1 hour before roasting. Position a rack in the center of the oven and heat the oven to 300°F. Roast the beef until an instant-read thermometer registers 110°F for rare, about 1-1/2 hours, or 115°F for medium rare, about 10 minutes more. Remove the roast from the oven. Let sit, tented loosely with foil, for up to 2 hours (or continue with the recipe). Or, to sear on the stove: Heat the oil in a heavy 12-inch skillet until shimmering hot. Sear the beef, turning and pressing down with tongs, until browned all over and cooked to desired temperature, about 4 minutes per side. Transfer to a cutting board. If there was no earlier rest between roasting and searing, let the roast rest for 15 to 20 minutes. Slice and serve with the reserved mustard butter. 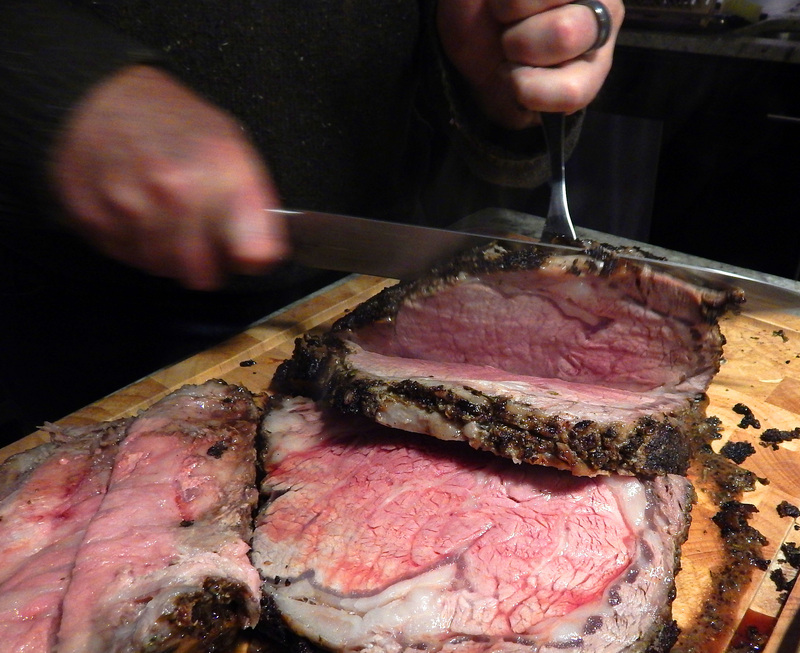 The beef can be roasted and then sit at room temperature, tented with foil, for up to 2 hours before the final sear. What a perfectly elegant Christmas meal, which we followed up with a shot of Chartreuse. 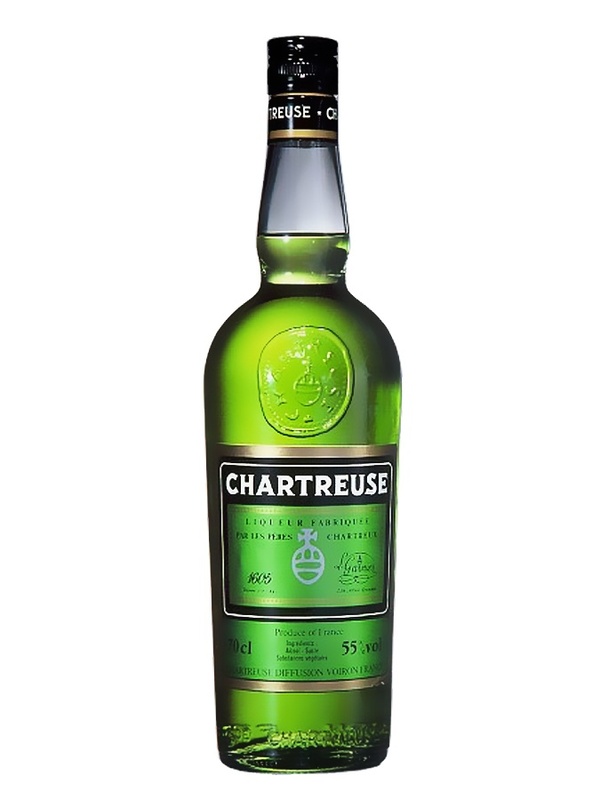 A lovely bright green French liqueur made by the Carthusian Monks since 1737. 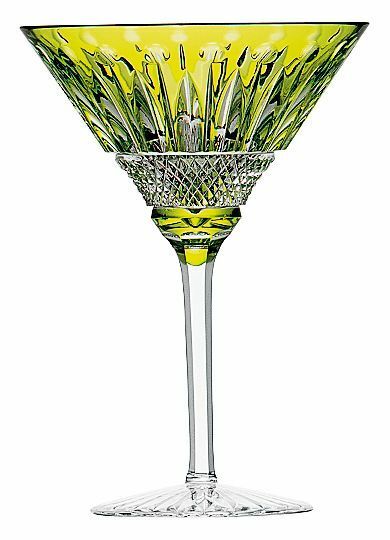 It is composed of distilled alcohol aged with 130 herbs, plants and flowers. A wonderful way to toast the season!